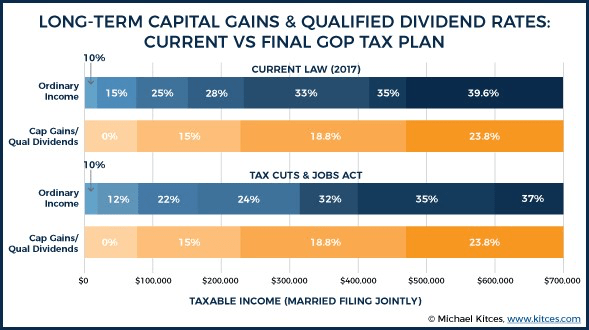 As many of you are aware, the new tax law, dubbed the Tax Cut and Jobs Act (TCJA), was passed at the end of last year. 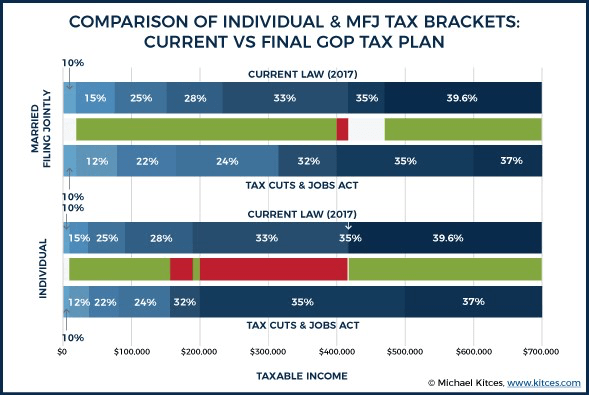 In this WJ Notes, we will summarize many of the tax changes that have taken effect in 2018. It should be noted, however, that since this law was passed under a simple majority vote in the Senate, a “sunset” provision was included, meaning that these individual tax changes will no longer apply after December 31, 2025. Under the new law, the standard deduction increased to $24,000 for MFJ and $12,000 for individuals, almost double that of the previous standard deduction. However, because of that increase, many will no longer be able to claim itemized deductions since the new standard deduction will exceed the itemized deductions for many taxpayers. The law also suspended personal exemptions which previously reduced a taxpayer’s AGI by $4,050 per personal exemption. For those able to claim a child tax credit, the child tax credit increased to $2,000 per qualifying child, up from $1,000. This credit now begins to phase out for taxpayers with AGI above $400,000 (MFJ) and $200,000 (all other taxpayers). State and local property and income taxes are deductible but only up to a maximum of $10,000. Mortgage interest is now deductible up to $750,000 of debt principal (previously $1,000,000) for new mortgages originated after December 15, 2017. Additionally, the interest on home equity loans and home equity lines of credit (HELOC) is no longer deductible unless those loans were used to acquire, build or substantially improve the home. Any other use of funds from a home equity loan or HELOC will make the interest on this type of loan non-deductible. Medical expense deductions will be allowed if they exceed the new threshold of 7.5% of AGI (previously 10% of AGI). However, after 2018, the threshold goes back to 10%. Therefore, for clients that know they need a costly medical procedure, it might be beneficial from a tax perspective to complete the procedure in 2018. Personal casualty losses (damage to homes, vehicles, etc.) not covered by insurance and that exceed 10% of AGI will no longer be deductible unless the loss occurred in an area that was declared a national disaster (such as Harvey). Investment advisory and tax preparation fees will no longer be allowed as an itemized deduction. With the new tax law, Roth recharacterizations (converting a traditional IRA to a Roth and then back to a traditional) will no longer be allowed for conversions made after December 31, 2017. For those that converted a traditional IRA to a Roth in 2017 and wish to recharacterize that conversion, they will be able to do so in 2018. For 2018, the annual gift tax exclusion was raised to $15,000. This means any individual can gift up to $15,000 per person without paying gift tax. For example, a couple wishing to gift money to their two grandchildren will be allowed to gift a total of $60,000 without paying gift tax ($15,000 from each grandparent to each grandchild). Another change in the TCJA legislation was the doubling of the estate and gift tax exemption. The original amount for the exemption was scheduled to be $5.6MM per individual. However, that amount was increased to $11.2MM per individual ($22.4MM for married couples). Therefore, an estate with less than those amounts will no longer be subject to estate tax. The new law also made 529 college savings plan a more attractive vehicle to save for education expenses by now allowing tax free distributions to be made for private elementary and secondary school expenses. However, the distribution for private elementary and secondary school expenses is capped at $10,000 per student. Unfortunately, homeschooling expenses are no longer included in that provision. In addition to these tax changes, there are other tax changes and strategies available depending on your situation. A WJ advisor can help you determine which tax strategies are best for your financial situation. We appreciate the confidence you’ve placed in us to help you reach your financial goals and objectives.